December 1, 2013 Head of the Hamas Political Bureau, Khalid Mishaal, on Sunday, arrived in Kuala Lumpur, the capital city of Malaysia, to attend the annual conference of the UMNO political. The Hamas delegation encompasses senior leaders of the Islamic movement such as Mohamed Nasr, Sami Khater and Osama Hamdan. A senior source of Hamas told the Palestinian Information Center (PIC) that Mishaal is due to meet with the Malaysian Prime Minister, Dato Seri Najib Razak, the Secretary General of the UMNO party, Gov. Seri Mansur , and a number of other political leaders in the country. He stated that Mishaal will deliver a speech on Tuesday at the International Forum, which will be hosted by the UNNO party, ahead of the opening session of the annual general conference. Then he will deliver a speech at the International Islamic University-Malaysia, which includes students from more than 100 nationalities, including Palestinians. This is the first official visit to Malaysia, done by the head of the political bureau of Hamas, which is an indication of the level of development of the relationship between movement and Malaysia. The Prime Minister of Malaysia visited Gaza in January 2013 to help break the siege, imposed on the Gaza Strip. The International Islamic University-Malaysia has long been part of the Global Muslim Brotherhood network. In 2008, we reported that Dr. AbdulHamid AbuSulayman, one of the most important figures in the history of the global Muslim Brotherhood, was a guest of honor at the 25th anniversary celebration of the International Islamic University Malaysia where he was rector from 1989-1999. Despite characterizations of Meshaal as a “relative moderate” in October 2012 Meshaal gave a speech in Cairo in which said that “Nothing will restore the homeland but jihad, the rifle, and self-sacrifice” and that Zionists are the enemies of Allah and of Muhammad, Jesus, Moses, and Abraham – the enemies of the Prophets, of the Messengers, of values, and of morality.’ In December 2012 Meshaal reiterated his call for the complete destruction of Israel during his first ever visit to Gaza in honor of the 25th anniversary of the founding of Hamas. In March, we reported that Hamas had re-elected Khaled Meshaal as the head of its political bureau. 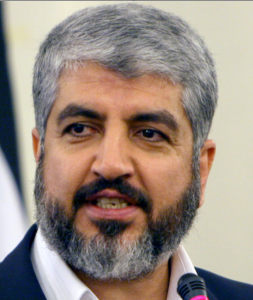 In September 2012, Reuters reported reported that Meshaal had decided to step down from his position as head of the Hamas political leadership. In October 2013, the GMBDW reported that Meshaal) had paid what was described as a “surprise visit” to Ankara in order to meet with Turkish Prime Minister Recep Tayyip Erdogan.